Having explained different methods of advertising on social media, including both, paid and free, methods, let us see how to approach the promotion activity on social networks. Promotion on social networks is one of the main motives for companies being present on social networks, so we will see the ways you can leverage your social media presence into profitable activity. Each social media activity should start with a plan. A planned activity will allow you to measure the results in order to analyze the effect of the promotion. In addition, when you plan what to promote on social media, you will have in mind the overall activity of your company, company’s goals, as well as company’s resources that can be used in the purpose of promotion. Drive traffic to your website and blogs – Sharing content on social networks is usually accompanied by a link that points to the original place where the content is published, which might be your website or blog. You can provide a short preview of the content, by sharing a couple of lines from the article, or one of the images from the gallery. If the social media users want to access the full content, they will have to click on the link provided in the status update. In this way, social media activity has a positive influence on the website traffic. Increase engagement – Promoting quality content can also help with increasing engagement, as social media users are more likely to become engaged if they see valuable and interesting content. Users are encouraged to like, share or comment, while you increase the visibility of your account on social media by having a high level of engagement. Build trust – Building trust among your followers and increasing loyalty is an important goal of social media marketing, and posting quality content can help you with this goal. If your promote content that is of high quality and reliable, users will start to trust you and you will create a respected authority on social networks. This will have a positive influence on your long-term goals of your social media marketing. Besides content, social media is a perfect platform for promoting the products or services your company provides. However, you have to be very careful with this kind of promotion, as it might seem too promotional and profit oriented. While with promoting content, you provide value to the users, and create trust, promoting products or services, you expect users to buy. Using this type of promotion you are trying to persuade your social followers to buy from you. This is the reason why you must not be too aggressive and persistent with promotion of products. You also need to be subtle when promoting. Useful product – Try to share an image or a video where you demonstrate how useful your product is. Instead of adding some promotional tag line, you could try adding something like “Good thing I have one of these” or “ to the rescue”. This kind of approach emphasizes the quality and usefulness of product, which will have a positive influence on your social followers. Customer recommendations – Customer recommendations are part of word of mouth marketing, an important type of promotion which basically implies the promotion coming from the satisfied customers. Word of mouth marketing has gained a lot of importance along with the development of social networks, as the information about products can be shared easily, and it is available to the large group of people. Sharing the positive reviews and the comments of the customers can be a good way to supplement the process of promoting your content or services. Additionally, some social networks, such as Facebook and Google+, allow integration of Review button, which is extremely helpful if you want to publicly display recommendations posted by the social network users. However, you should have in mind that once you enable Review button, all users will be able to post their own reviews, regardless if those are positive or negative. 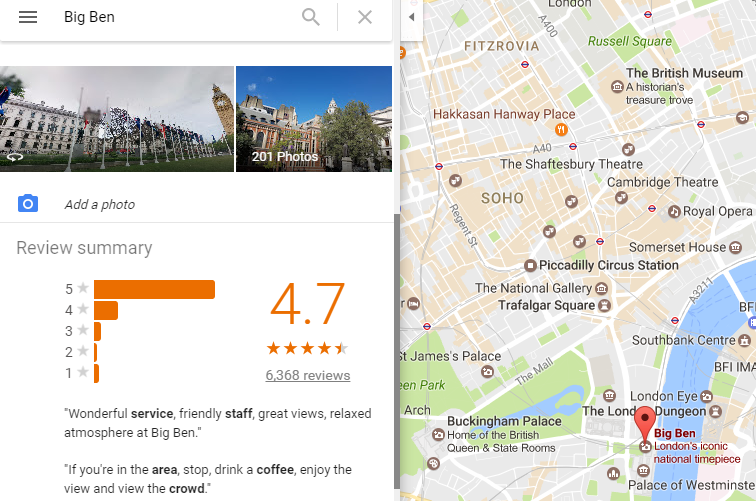 Facebook allows adding reviews on the pages, while Google+ has this feature integrated as a part of Google Maps. Praised by others – Another way to promote your products or services is to share recommendations published by other influential people or brands or social networks. If your products were featured in a magazine or on a blog, you could also publish this, in order to promote your company. These kinds of mentions and recommendations can help with maintaining the subtle approach when promoting, but you will still be able to showcase the products or services you, as a business, have to offer. Share recommendations – The most basic approach you can use is to share a recommendation with your social followers. It is usually in the form of a status update where you recommend something to your followers and you ask them to click on the link, or like a page, etc. In order for this approach to work, you will have to have a lot of social followers, and you will also have to enjoy a great amount of respect and authority among those followers. Post a review – Another effective way to promote third party on your social media accounts is to publish a review of that third party product or service. You can create and publish an article on your blog, or you can record a video review. Even though you want to promote this third party product or service, you should try to be objective, in order to maintain the trust and loyalty of your social followers. Regardless if you are promoting something, you want to keep working on providing high quality to your followers, as this affects the authority you create on social networks. You do not want to jeopardize your reputation by promoting a product that does not deserve to be promoted by you. You should only promote the products you truly believe in. Collaborate on a project – Collaboration with other companies or individuals is a great way to promote third party content or products. There are different types of projects you can work on together, such as videos, research, etc. The goal with this approach is to choose to collaborate with companies, and through promotion of this project on social networks, both participants in the collaboration will be promoted. Again, it is important to carefully choose with whom you are going to work with, as you must avoid negative responses which might harm your reputation on a specific social network. Now that we know what we can promote through social media, we will present some ways how you can promote in order to increase visibility on social networks. Having defined your approach to social media marketing and having developed the strategy that you are going to realize, you can use some of these things to improve the efficiency of that strategy. Hashtags are excellent for trying to reach people who are interested in a certain topic. Using hasthags will help you reach people who are not necessarily your followers or friends, but instead you will reach people who use social network to look for a topic of their interest. Hashtags are particularly popular on Twitter and Instagram, while they can be used on other social networks such as Facebook and Google+. Adding hashtag will help label your status update, so that people can easily find it. For example, if you sell beauty products, you can use hashtag beauty in your status update. This way anyone who types beauty on this social network will be able to find your status update, if it is publicly visible. Images are known to be the most popular type of content on social networks, which gets the most engagement and the largest number of shares. This is why using images is highly recommended when you want to promote your social account, and when you try to reach more people. Sharing quotes is another good strategy for promoting content. People can related to the quotes in some way, regardless if they agree with the statement, they like the author you are quoting or they have read the book from which the quote is taken from. Being able to relate, people are more likely to respond, most often by liking or sharing such status update. Share a teaser – Creating a teaser will help you get people interested in the news you have prepared. You will create a sort of a buzz related to your company, which is a good strategy for increasing the interest and getting people to talk about you. Share a couple of images or a short video in order to announce that you are about to introduce something new, and people will be anxious to see what you have prepared. Countdown – Since you already have scheduled the big introduction, you can start counting down until the official event. This way you prepare the audience for the big event and you remind them that there are only a couple of days left until they are able to see the new products or services you have to offer. Besides counting the days, you could also feature the “Coming soon” sign as a part of your status updates or images. Organize an event – Even though the promotional activity around the introduction of new products or services is conducted through social media, you need to organize an official event where you will introduce news from your company. If you are unable to host an event, you can even organize a virtual event where you would stream the official presentation via YouTube or other platforms that enable video streaming. You will use social media to announce and promote this event. Share images – Once your products or services have been introduces, you should share impressions from the event you have organized. This is good for promoting the products, as well as for promoting the company in general. Besides sharing the atmosphere from the event where you have introduced the product or service, you should also share official images as a part of promotional activity. Those images are usually used on packaging, posters or flyers, but you can use them for social media promotion as well.